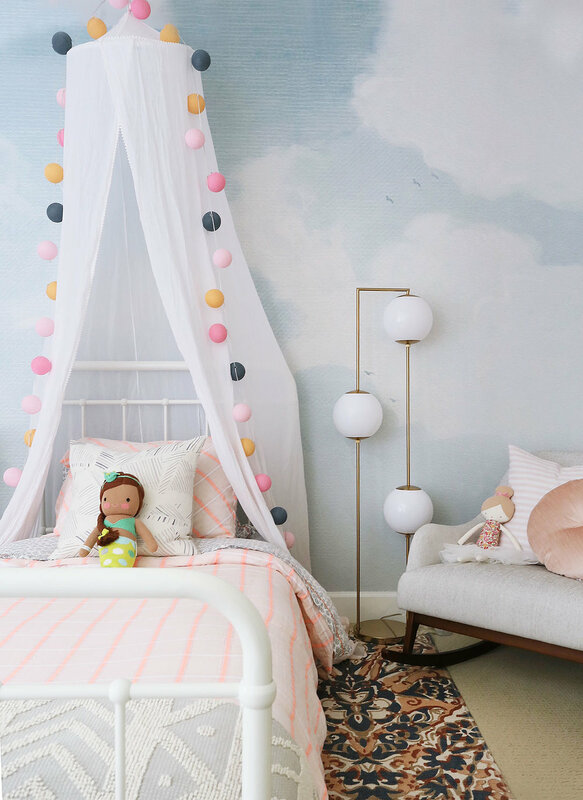 Welcome to the happiest and most playful place in our home – my 3-year-old Zora's big girl room! She loves the following things: princesses, mermaids, castles, the color pink, songs with only girl singers, cupcakes, Peppa Pig and all things...well GIRL (or guurrll as she puts it). I really wanted the room to feel fun and happy, but also a space she could grow into. Call it 'child-like sophistication'. I loved the idea of wallpaper, but nothing too bold or trendy. I wanted a pattern that would be timeless and feel light, fresh and airy. And what is airier than...well clouds and air? This cloud mural from Arenal was a perfect choice! It could really go in any spot in our home and who doesn't love looking at big fluffy clouds all day? I needed the area under her window to be multi-functional: one part toy storage, one part seating and one part comfy and cozy! Those linen roman shades from PB Teen worked to add some cozy layers to the window and the sweet pom-pom tassel curtains from Anthroplogie gave just enough of a whimsical and light dressing around the window. And I'm in love with that custom-made window seat cushion! It's so well-made and luxurious! I found the maker on Etsy and she was wonderful to work with! The dresser is an oldie but goodie from Ikea (discontinued, unfortunately!) and the rattan mirror is from Urban Outfitters. Unfortunately, I purchased it a while back and it appears to now be sold out, but here is a similar style from Pottery Barn. The sweet rainbow stacker toy is from Amazon! That adorable dollhouse was her Christmas gift from last year and it has been one of the most played with toys of all time in our house. 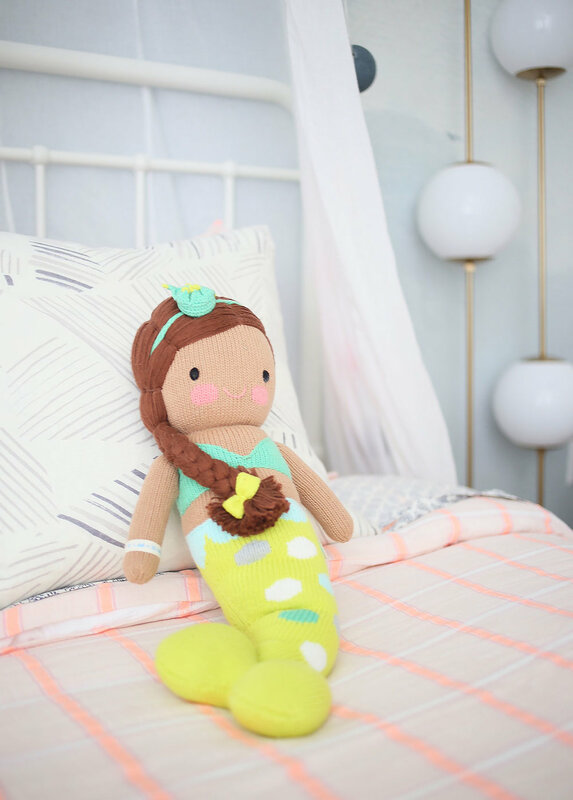 And she adores her Cuddle & Kind mermaid baby doll. I love that they ethically produce hand knit dolls and 1 doll = 10 meals for kids in need. I upgraded her old rocker to this beauty from Article. She still loves to rock at night and read before bed and I love that its petite enough to fit in this little corner of her room. And I can't get enough of those adorable flamingo animal heads from Target! That adorable little night light is from Little Belle. Its so unique and beautiful and I love that its made in New Zealand! She loves to play, dress-up and read to her babies here and I couldn't be happier that she loves her room! Kids rooms are just SO MUCH FUN to style and design! I need to have more kids so I can create more rooms! (kidding...my husband is a hard stop on 2).